Canada has just published revised regulations for its International Student Program (ISP), effectively concluding a process of consultation and regulatory reform that had unfolded over the past year. The new regulations will come into force in June 2014, but the process through which they will be implemented is less clear. 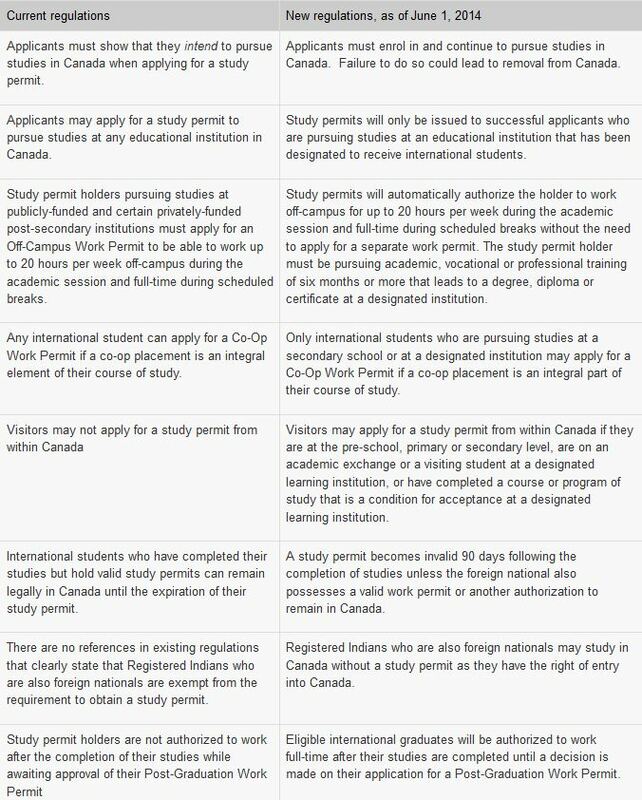 The major change under the amended regulations is that only students enrolled at designated institutions in Canada will now be able to apply for a study permit (that is, an international student visa). The EQA is a quality assurance mechanism specific to British Columbia, and it is the only such designation in Canada. The process by which institutions will be designated in other provinces or territories is not yet clear, but – as the BC example suggests – the development and implementation of processes for designating institutions will likely extend well beyond the June 2014 implementation date for the new regulations. A major implication of these changes, according to the definitions provided by Citizenship and Immigration Canada (CIC), is that work rights will not extend to students enrolled in language study. Mr Peralta confirms as well that Languages Canada, the country’s peak body for language training, will continue to lobby the government on the issue. The following table provides a full summary of the confirmed changes from a 12 February 2014 government news release. Please see the complete regulatory statement and the accompanying CIC news release for additional detail and background. This entry was posted in Agents, Canada, Higher Education, Immigration, Most Popular, North America, Regions, Vocational, Work Abroad and tagged work permit, secondary schools for international students, college admissions, vocational studies, immigration reform. Awesome Thanks to CIC officials and Charles Hoppers government for giving us this Long wishing opportunity to work while studying in Canada. Now i could get a job and save up money to help myself. I am planning to study in Canada but I am not fulfilling the IELTS requirement with 5 bands in one module…..so I am filling under general case so any new rules which can make easier for me to apply. Im living in UK and want to apply for Canada. Can you advice me anyone the best way? How can I apply for a visa? I am from Pakistan. How much IELTS points do I need to get an opportunity to go Canada? And how much cash do I need? Please let me know. How can I apply for a visa? I am from Pakistan. I want to study in Canada without ielts. How can I get visa and how much money do I need for visa? Contact me on email..thanks!